On 22 April 1929 two aircraft carried a civic party, led by Manchester’s Lord Mayor Col. George Wescott, from Wythenshawe to Croyden to collect the temporary licence for the newly opened airfield. Seen here are Town Clerk F.E. Warbreck Howell (left) and Alderman R.A.W. 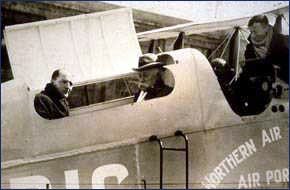 Carter, the deputy chairman of the Aerodrome Committee, seated in a De Havilland DH9c G-EBIG of Northern Air Lines. Manchester's first major airfield at Alexandra Park closed on 24 August 1924 when the landowner refused to sell the site for permanent use. 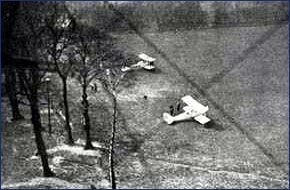 As the City Council wanted to be the first in Britain to have its own licensed airfield, a temporary aerodrome on the site of what is now Wythenshawe’s Rackhouse Estate was used between April 1929 and the opening of Barton Airport on 1 January 1930. Opened on 1 January 1930 as what would hopefully become Manchester’s airport for the future, Barton was to prove a totally unsuitable location. Built on boggy terrain, the grass airfield was unable to serve the larger and heavier aircraft coming into service in the 1930’s. KLM’s rejection of the site in 1934 led the council to cut their losses and after a close vote plans were drawn up for Ringway. This time great attention was paid to creating a level and well-drained landing surface. 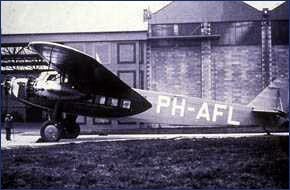 Manchester's airport at Barton opened in January 1930 and was keen to enlist KLM Royal Dutch Airlines to provide an air service linking the city to Amsterdam. 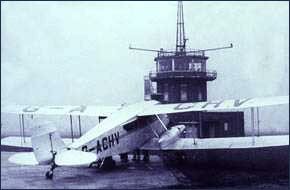 On 23 January 1934 a senior KLM pilot flew into Barton to test the facilities. He confirmed that Barton was unsuitable for the larger, heavier aircraft coming into service, a bad blow to the Council which eventually resulted in the decision to build Ringway. A typical late 1930's scene at Manchester's Barton Airport with G-ACHV, a De Haviland DH84 Dragon parked beside the control tower. 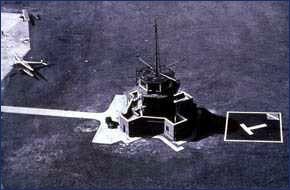 The tower still looks much the same today and Barton’s grass runway is used by large numbers of private light aircraft. 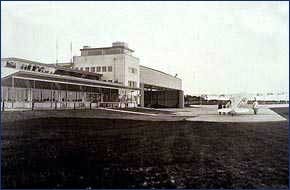 After nearly three years of construction work, Manchester’s Ringway Airport was officially opened on 25 June 1938. Seen here outside the smart new terminal is G-AEAJ a DH Dragon Rapide of Isle of Man Air Services. Early links were to Amsterdam, London and the Isle of Man, initially as an extra stop on Liverpool’s existing services. 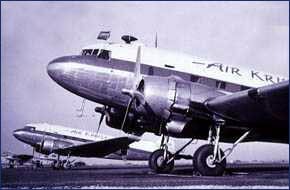 On 26 October 1938, Manchester’s all-important KLM service from Amsterdam was unable to land because of thick cloud and poor visibility, and had to return to the Netherlands. 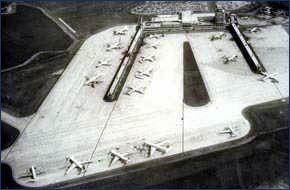 This incident and other minor mishaps convinced the Corporation to improve Ringway’s navigational aids, and in January 1939 the airport installed the first illuminated concrete fog line outside the U.S.A. 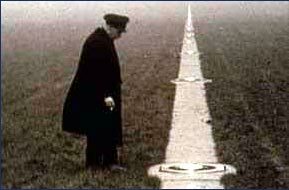 This 4,200 ft long 24-inch wide line later formed the basis of today’s main Runway One. An early plan of the airfield shows the position before the onset of war transformed the site dramatically. Ringway was to play a major role in World War Two as a centre of aircraft production and modification, with Fairey and Avro eventually producing over 4,500 aircraft here. In addition the site was developed as the main training establishment for Airborne Forces, with over 60,000 paratroopers trained. The Douglas Dakota formed the backbone of civilian air services from Manchester from the late 1940’s until the early 1960’s. Air Kruise operated the first officially licensed inclusive tour service (what we now know as package holidays) on 29 May 1955 to Ostend. Such inclusive tour and charter traffic was to become an important part of Ringway’s rapid growth in the following decades. A very busy scene on 28 May 1964 shows Ringway’s greatly improved facilities put to full use. 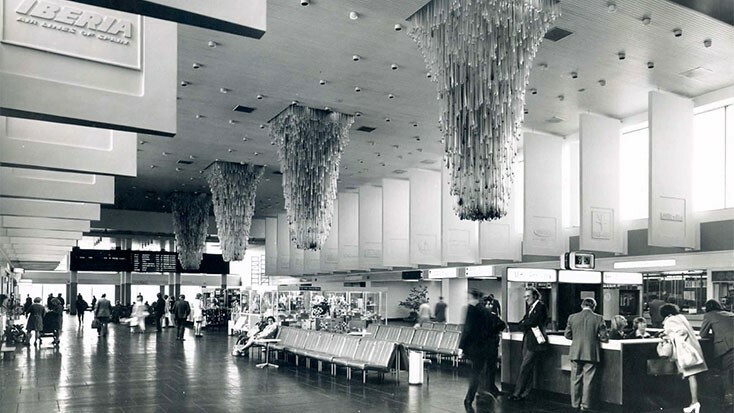 A huge step forward came with the opening of the modern new terminal building (now Terminal One) on 22 October 1962, incorporating many of the latest ideas such as covered piers and a hydrant fuelling system. By now the airport was handling over a million passengers per year.